me and him: my valentines flowers came in a box. my valentines flowers came in a box. not supposed to like flowers in a box. i love flowers that come in a box! plus i've always wanted to get a box of flowers in the mail. i told jason this a while ago. i guess he was listening. hmmm. jas and i don't have our plans made for tomorrow night. oh what to do, what to do. and they are so happy and pretty. So sweet when the hubby's do what we want them to! How fun for you! I love tulips also. You are a lucky little lady. Getting tulips from your Valentine is the best! Happy Valentine's Day! Soo pretty. Those would have made me happy, too! yay! 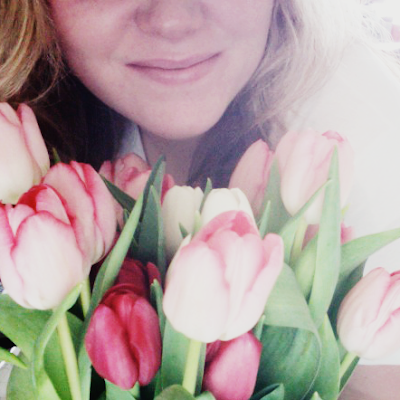 i got tulips too! and they are pink too. my fav.